Cyclone Idai struck Malawi, Mozambique, and Zimbabwe in March 2019. The storm lasted just over two weeks, but the devastation will take much longer to recover from: Torrential rains have caused intense flooding, infrastructure has been damaged beyond recognition, fields (the main source of income for these agricultural communities) have been destroyed, and over 2 million people have been displaced or otherwise impacted. 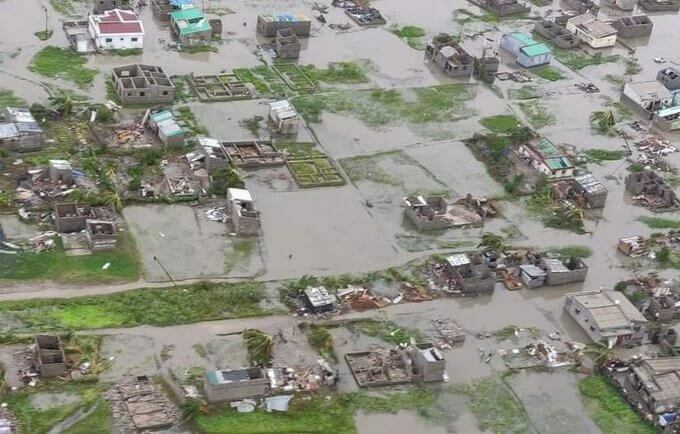 Aerial view of the damage to Beira, Sofala province in Mozambique. Without access to laundry or showers, women are at risk for infections like UTIs. 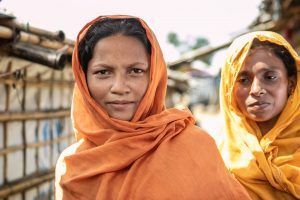 Dignity kits provide clean underwear, menstrual supplies, soap, and other items in a portable bag or bucket so that women can feel clean and empowered. In the aftermath of a natural disaster, UNFPA distributes these dignity kits to women and girls at refugee camps or other similar locations. Flooding has devastated healthcare infrastructure in Malawi, Mozambique, and Zimbabwe. This has left 75,000 pregnant women with little or no access to pre- and ante-natal care, which is essential for safe pregnancies. 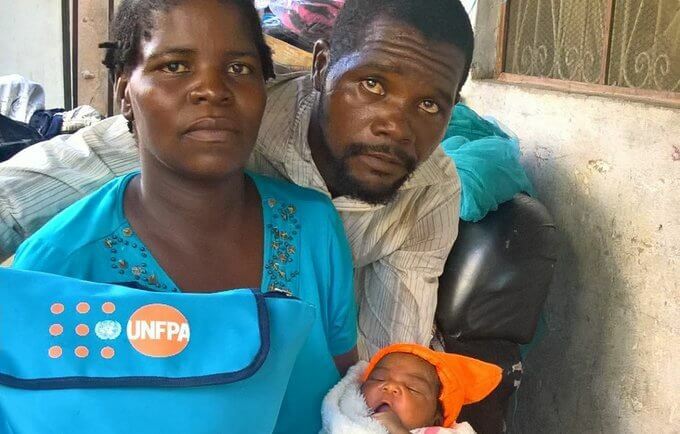 As part of its commitment to help women after Cyclone Idai, UNFPA is on the ground in the affected countries providing life-saving supplies to ensure clean deliveries and offering skilled midwifery care, so that mothers and newborns can have the safe birth that is their right. Women don’t stop having children in times of crisis, but all women need a safe place to give birth. Just a few supplies can make a world of difference for a mother and her baby. Clean delivery kits provide a plastic sheet, soap, gloves, a razor, and other essentials so mothers in crisis situations can have a safe birth. Like dignity kits, UNFPA also provides clean delivery kits as part of relief efforts following disasters like Cyclone Idai. In times of crisis, women and girls are more susceptible to gender-based violence (GBV). Women and girls are more likely to sleep in the open, or in crowded shelters and camps with other families that include other men. Women and girls are also less likely to have private bathrooms after disasters like Cyclone Idai destroy homes. This makes it easier for predators to take advantage of a situation that makes women more vulnerable. Women and girls bear the brunt of crisis situations. They are more likely to take on extra care responsibilities, go without food, engage in prostitution for survival, or be married as children. One of the ways to help women and girls after Cyclone Idai (and other natural disasters) is to ensure that they have safe spaces to access sexual and reproductive healthcare resources, but also psychological counseling and legal advice. Women especially need to be able to talk to other women, so that they can realize that they are not alone. The fallout from Cyclone Idai will affect communities in Malawi, Mozambique, and Zimbabwe for months if not years. 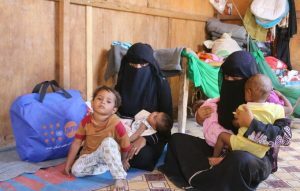 But there are ways to help those most affected by this crisis: UNFPA works to provide these 5 essentials to women and girls. Access to items like clean delivery kits, dignity kits, and medical kits can save the lives of mothers, newborns and children. Combined with safe spaces and community support, they also help to ensure that families can begin the healing process and communities can begin to recover. Help us support UNFPA’s life-saving work towards Cyclone Idai recovery.